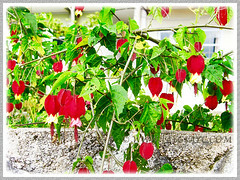 Truly a beauty, the Abutilon megapotamicum or Brazilian Bellflower as commonly named with its spectacular lantern-shaped vivid red and yellow flowers presents an interesting sight. This is especially delightful when the plant is bursting with blooms! Every arching stem that’s adorned with bright green foliage can hold many gorgeous pendulous flowers in different forms, shapes and colors depending on their blooming stage. 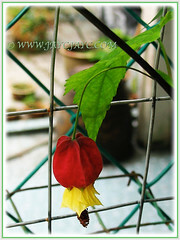 Botanical Name: Abutilon megapotamicum (syn. 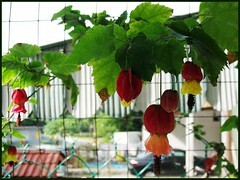 : Abutilon vexillarium). 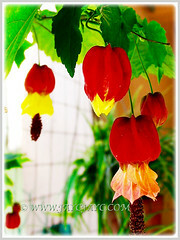 Common Name: Flowering Maple, Trailing Abutilon, Brazillian Bell-flower, Chinese Lantern. Origin: Native to Argentina, Brazil and Uruguay in South America. Plant type: An ornamental perennial viny shrub. 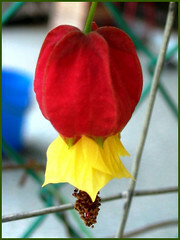 Features: Abutilon megapotamicum is considered the most spectacular plant in the Abutilon genus that consists of about 200 species of flowering plants. It is an evergreen or semi-evergreen shrub growing between 1.5-2.5 m tall and spread as wide. It’s also known as Trailing Abutilon with its narrow and arching stems that are both delicate and graceful and covered with bright green foliage. Leaves are about 5-8 cm long, ovate and tapering, plus shallowly 3-lobed resembling maple leaves, hence commonly called Flowering Maple. This trailing vine produces buttery-yellow 5-petalled flowers, about 4 cm long that emerge and droop from the distended brilliant-red calyces. The petals will age to a lovely apricot before falling. It has a dark red central column with numerous yellow stamens that mature to dark brown, protruding about 1.3 cm from the yellow petals. 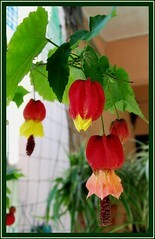 These pendulous and bell-shaped or lantern-shaped red-yellow hermaphrodite flowers, about 3.8-5 cm. in overall length are really captivating! 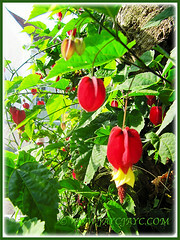 Culture (Care): Abutilon megapotamicum or Brazilian Bell-flower grows easily with minimum maintenance. Light: Full sun to light shade. Preferably morning sun and sheltered from the strong afternoon sun that can scorch its foliage. Moisture: Water moderately and regularly, though can be quite drought tolerant once well established. However, best to keep it moist and not too dry as it can cause leaves to dry and wilt. It benefits from humid conditions. Soil: Well-drained soil, light (mix of sand and loam) and fairly fertile. Others: Prune to remove unwanted growth, keeping it compact and to promote bushiness. Deadhead to prevent seeding and maximise longevity of plants. Feeding once monthly with a balanced liquid fertiliser is sufficient, otherwise heavy feeding will induce more foliage at the expense of flowers! Watch out for white flies and mealy bugs as Abutilons are susceptible to them. Give them a preventive spray of pesticide occasionally or hard prune when the garden pests infestation gets too large for treatment. For subtropical and temperate regions: Hardiness: USDA Zone 8b-11. A popular perennial plant in subtropical gardens and an annual in non-hardy regions. Provide a deep mulch in winter for protection from frost. It will normally emerge again from the base in the spring. The plant will produce foliage from winter to spring and flower from summer to autumn. You can propagate by seed or by softwood cuttings in spring. Propagation: From semi-hardwood cuttings. Can also be grown from seeds. Usage: Abutilon megapotamicum will be an excellent ornamental plant on trellises or trained over arches in your garden, patio or conservatory. As a fast growing vine, it’ll add color to your fence or screen or even as an espalier to decorate and brighten a barren wall. It is ideal for container gardening in a reasonably large pot or hanging basket. Also, it’s suitable to be planted in a perennial border or bed below a tree and train it to climb up the tree trunk as a stand-alone specimen to add interest and structure. One setback is that this Abutilon megapotamicum though considered the showiest among the Abutilon genus with its exotic flowers is such a magnet for mealy bugs and white flies! And we’re often tempted to ponder whether it’s worth all the effort to maintain it with regular spraying of pesticide, which may be detrimental to other beneficial bugs that reside in our garden too! Hmmm?? Meanwhile, this lovely upright and spreading climber stays on with regular pruning and often times hard pruning to control infestation. I haven’t seen this plant in Malaysia! Its so beautiful! Do you still have it? How is it now? very beautiful plants, i have not seen it yet here! Thanks, Andrea! A stunner, indeed! where can i buy this plant? or seeds? i live in south australia. had one in queensland. Thanks for the info. I have so often come to, and enjoyed your site. I just got a plant from Gardino Nursery here in Florida. Hope mine does not get mealybugs, but the insects can be a real problem here. If they are a problem for this plant, it will come out, but will enjoy it in the meantime.